Image Caption: Former Mexican President López Mateos (left) was one of several presidents to navigate a complex and often contradictory Cold War foreign policy that tended to strain Mexican relations with the United States. With the Allies’ victory in 1945, the United States cemented itself as a global superpower. The U.S. was the only major belligerent to escape the conflict largely unscathed. Its economy was thriving, and it was the only nation in the world to have developed and used atomic weapons. But just when it seemed that the United States would successfully set about crafting a new world order through the establishment of multilateral organizations like the United Nations, a new threat emerged. The Soviet Union, an American ally during World War II, developed a chokehold on Eastern Europe immediately after the war, propping up repressive communist satellite regimes to create what Winston Churchill dubbed the “Iron Curtain” in 1946. The U.S.S.R.’s totalitarian communism and America’s democratic capitalism were deemed irreconcilably different by the leaders of both nations, and the Cold War was born as “the superpowers engaged in a global struggle for nothing less than ‘the soul of mankind,’ each advancing their own agendas for the betterment of all.” Soon, both nations possessed nuclear weapons, meaning that a military conflict between them would have the potential to exterminate the human race. Thankfully, the Cold War did not play out as a conventional war. Rather, it was a geopolitical rivalry that manifested itself through military alliances, clandestine operations, and proxy wars as both the U.S. and the U.S.S.R. sought to spread their respective ideologies throughout the world. Caught between the competing American capitalist and Soviet communist camps was the so-called Third World, made up of nations that refused to align themselves either way in a bid to remain neutral. Despite its proximity to the United States, Mexico was one such nation. In many ways, Mexico’s Cold War experience was shaped by the Mexican Revolution. The government’s decisions, first to stand with Fidel Castro’s leftist regime in Cuba and later to support insurgent movements in Central America, were founded on a tradition of defending national sovereignty and self-determination dating back to the Revolution. Furthermore, certain sections of Mexico’s population, namely college students, unionists, and peasants, commiserated with Marxism, yearning for a Revolution they felt had gone unfulfilled. This sentiment was only exacerbated by the Mexican state’s authoritarian streaks, as the Mexican government found itself forced to choose between opposing the United States or its own citizenry. Mexico was one of the few countries to enjoy virtually uninterrupted diplomatic relations with the Soviet Union from the 1920s until its dissolution in 1991. This relationship was diplomatically and economically modest, with neither Mexico nor the U.S.S.R ever seriously considering a formal alliance with the other. Its climax arguably came during the late 1950s, as Soviet leader Nikita Khrushchev mandated an expansion of the Soviet Union’s influence in the Third World at the same time as Mexican president Adolfo López Mateos looked to decrease Mexico’s commercial dependence on the United States. In November of 1959, the First Deputy Chairman of the Council of Ministers of the Soviet Union, Anastas Mikoyan, visited Mexico and opened an exhibit on life in the U.S.S.R. that was visited by over one million Mexicans in less than a month. The Soviet Ambassador raved of the visit’s success and negotiations over a trade agreement were rumored, but nothing ever materialized. The United States quietly accepted such mild engagement, with the only cause for concern being allegations of espionage operations based in the U.S.S.R.’s Mexico City embassy. Fidel Castro’s capture of Havana and deposition of U.S.-backed dictator Fulgencio Batista on January 1, 1959, proved far more consequential to Mexico’s relationship with the United States. The Cuban Revolution had begun on July 26, 1953, when Castro and a group of his fellow insurgents unsuccessfully tried to seize a government barracks. Castro was arrested and jailed until 1955, when he was released and fled to Mexico City to reorganize his rebellion. He returned to Cuba, and completed his revolutionary mission. In just a few years, Castro’s crew of students and professionals became an organized movement capable of toppling a government. Once in power, Castro set about implementing a variety of radical reforms, including the nationalization of foreign property and the redistribution of land. The Cuban Revolution shocked the United States because of its proximity. Although it had not been an explicitly Marxist movement, the radical views it brought to power presented a clear affront to the United States. As it became clear that Castro’s radicalism would not fade with time, President Dwight Eisenhower decided to take action. On January 4, 1961, the U.S. cut diplomatic ties with Cuba, marking the first major reversal of the World War II-era Good Neighbor Policy toward Latin America. Tensions continued to escalate in the following months under new U.S. president John F. Kennedy, and on April 16, 1961, the United States launched the Bay of Pigs Invasion of Cuba. About 1,500 Cuban exiles, armed, trained, and financed by the American government, landed on Cuba’s southern coast, but were soundly defeated. When news of the invasion reached Mexico, former president and populist icon Lázaro Cárdenas tried to fly to Cuba as a show of solidarity toward Castro’s regime; it took a moratorium on all Mexican travel there by López Mateos to stop him. Elected and inaugurated in 1958, López Mateos had been in office for less than a year at the time of the Cuban Revolution’s conclusion. He entered the presidency promising to accelerate reform, and by the time he left office in 1964 had redistributed about 30 million acres of land, more than any Mexican president since Cárdenas’ administration of the 1930s. Following the Bay of Pigs debacle, however, his presidency was dominated by questions over Mexico’s relationship with Cuba. With Mexico’s general population expressing sympathy for Castro at Cárdenas’ urging, López Mateos was paradoxically caught between disavowing communism and praising the Cuban Revolution to affirm his commitment to Mexico’s own revolutionary ideals. To this effect, López Mateos firmly condemned America’s attempt to invade Cuba and invited Cuban president Osvaldo Dorticós Torrado on an official state visit. While López Mateos was certainly not interested in an alliance with Castro, he was willing to foster a relationship built on mutual nonintervention between Mexico and Cuba. In just a few years since the Cuban Revolution, Cuba had built a reputation for itself as an ‘exporter’ of revolution by encouraging subversives around the world and especially in Latin America. Implicit in Mexico’s decision to oppose American intervention in Cuba was an understanding that, in return, Cuba would not export revolution to Mexico. On December 2, 1961, Castro declared himself a communist, further isolating Cuba and increasing international scrutiny on López Mateos. With several Latin American countries joining the United States in cutting ties with Cuba, the Organization of American States (OAS) convened in January 1962 to vote on whether or not to expel Cuba. Despite the fact that Mexico’s representative branded Cuba’s Marxism as “incompatible with the inter-American system” during the meeting, Mexico ultimately abstained from votes on expelling Cuba and on imposing economic sanctions and an arms embargo on the Cubans. Although Mexico was not alone in abstaining, all three motions were approved anyways. Mexico’s decision to neglect the United States’ wishes at the OAS in January 1962 had an immediate impact on their bilateral relationship. Kennedy postponed an official state visit to Mexico until June, and there were rumors that American foreign aid to Mexico would be cut off. Pedro Teichert, writing later that year, argued that Mexico’s refusal to side with the Americans was proof of “Latin American determination to change the traditional setup in spite of U.S. opposition,” and that the continued antagonism of Cuba would push the rest of Latin America to pursue greater autonomy from the U.S. In failing to endorse Cuba’s expulsion from the OAS, Mexico stayed faithful to the principle of mutual nonintervention that defined the two nations’ relationship. In fact, this tenet was based on a longstanding Mexican political tradition—the Carranza Doctrine. The Carranza Doctrine was the product of a 1918 proclamation by then-President Venustiano Carranza calling for mutual respect for national sovereignty through nonintervention. Before and during the Mexican Revolution, Mexico was the subject of repeated foreign interventions, most notably at the hands of the United States. Thus, post-Revolutionary Mexico championed nonintervention as a defensive reaction to its proximity to the United States. As one scholar put it, there is “only one credible threat to Mexico’s international security: the United States.” Given this, Mexico’s decision to stand by Cuba on the international stage is hardly surprising. Mexico was not defending Cuba for Cuba’s sake; in reality, Mexico was defending its own right to self-determination. The indisputable climax of tensions between the United States and Cuba was the Cuban Missile Crisis of late 1962. After the discovery of Soviet nuclear warheads in Cuba by American reconnaissance planes on October 15, the world held its breath for almost two weeks, the threat of nuclear war more real than ever before. While López Mateos refused Kennedy’s request for assistance in blockading Cuba, he did release a statement calling for the missiles’ removal. In the end, cooler heads prevailed, and the situation was resolved on October 24 with the removal of the missiles after Kennedy promised Khrushchev that the U.S. would never again invade Cuba and that he would be removing U.S. missiles from Turkey. Mexico [is for us] an example of how relations between Cuba and the rest of the Latin American countries can be with only one condition: that our sovereignty is respected, that there is no interference in our domestic affairs, that no mercenary expeditions are organized, that no sabotage campaigns are organized. Once again, Mexico had acted not in Cuba’s interest for Cuba’s sake, but for its own sake, upholding the principles of sovereignty and nonintervention and to appealing to a populace agitated over perceived mistreatment of Cuba by the United States. By 1964, it was clear that Mexico could not be swayed in its defense of nonintervention and Cuba. These constant confrontations “convinced Mexico that the OAS had become a U.S. tool to undermine governments that Mexico deemed reformist but that the United States perceived as communist threats,” leaving Mexico reluctant to participate in OAS policy-making for the remainder of the Cold War. In light of this, the United States was forced to adapt to Mexico’s position. Because Mexico could not be convinced to abandon Cuba, the U.S. was determined to find a way to benefit from the situation. Ultimately, a compromise was reached, as López Mateos agreed to involve the United States in his pursuit of “contradictory overt and covert foreign policies” with Cuba. In reality, López Mateos had pursued such contradictory policies since the Bay of Pigs Invasion in 1961. Although he publicly supported Cuba, declassified intelligence records show that he privately spied on Cárdenas, the student groups that formed as a result of his agitation, and on the Cubans themselves through the Mexican embassy in Havana. Details remain murky about how or when exactly this came to be, but it is widely accepted that he eventually acceded to U.S. involvement in espionage efforts in Havana. On September 3, 1969, Cuba’s ambassador to Mexico famously sent a diplomatic note to Mexico’s foreign ministry accusing Humberto Carrillo Colón, a Mexican national and press attaché at the Havana embassy, of being a Central Intelligence Agency (CIA) operative. While the evidence behind this allegation never surfaced, Carrillo Colón was recalled from the embassy almost immediately. The United States tolerated Mexico’s continued relations with Cuba once it found a way to benefit from them, but Cuba found itself with even less of a choice. While Castro privately distrusted the Mexicans in much the same way they distrusted him, he was forced to limit the extent of any response, as covert actions in Mexico would surely provoke an aggressive American reaction if discovered. Furthermore, Cuba’s relationship with Mexico remained commercially and symbolically significant to the island nation, and a loss of diplomatic relations would come at a great economic and political cost for the Castro regime. Thus, Cuba’s only real option for retaliation was to spread leftist propaganda in Mexico and hope to inflame the ideological strife that swept the country in the midst of the Cold War. The Cuban Revolution inspired a heated debate over the legacy of the Mexican Revolution in Mexico. While leftist protestors maintained that its ideals had gone unfulfilled and looked to Cuba as a model to be followed, the Mexican government sought to quell the protests and assure the public that it stood for the values of the Revolution. As Renata Keller puts it, “Castro and his fellow Cuban revolutionaries had unwittingly exposed a contradiction coded deep in the DNA of Mexican politics: the tension between the country’s revolutionary past and its conservative present.” This ideological tension gave way to a very real struggle, as leftist protestors and guerrillas clashed with clandestine and brutal government forces. In the 1960s, Mexico’s Institutional Revolutionary Party (PRI) was roughly halfway through its uninterrupted 71-year rule over the country. Founded in 1929, the PRI maintained power until 2000 by rigging presidential elections, deceiving the public, and silently crushing the opposition. In 1990, Peruvian novelist Mario Vargas Llosa famously declared that “the perfect dictatorship is not communism, nor is it the Soviet Union, nor is it Fidel Castro: it is Mexico.” The party’s name, laying claim to ‘institutionalized revolution,’ is an oxymoron, exemplifying its paradoxical claim to radical rhetoric and liberal ideals despite its conservative and strict style of governance. The PRI was not used to serious opposition, but this is exactly what it encountered in the wake of the Cuban Revolution. The Cuban Revolution had grown out of a tiny group of radical protestors; with the rise of leftist student movements and the latent presence of communism in Mexico’s unions, the country’s ruling elite felt they had a real cause for concern. Starting with López Mateos’ Cuba policy, the government employed a foreign policy aimed at appeasing Mexico’s dissenters, but as the protestors grew increasingly radical, the government’s response became distinctly authoritarian. The bulk of Mexico’s Cold War-era protest movement was made up of middle-class college students who commiserated with certain Second World nations antagonized by the United States, namely Cuba, the People’s Republic of China, and Vietnam. This was not necessarily motivated by ideology. Though the protestors were certainly left-leaning and radical, they were not necessarily communists. Rather, their solidarity was inspired by the sense that, like the aforementioned nations, Mexico was subject to American imperialism, ruled by a government that failed to truly represent its people. Protestors’ chants eulogized Castro, Mao Zedong, and Ho Chi Minh, and annual demonstrations on July 26 in commemoration of the Cuban Revolution became commonplace. The suppression of Mexico’s radical leftists began under López Mateos, who in 1959 ordered the removal of communist union leaders and university rectors and in 1960 authorized the imprisonment of famous muralist David A. Siqueiros for his role in organizing a student demonstration. However, it was under his successor, Gustavo Díaz Ordaz, that the situation truly escalated. Despite being extremely conservative, Díaz Ordaz maintained the public relationship with Cuba fostered by his predecessor. Domestic policy was what changed, and as Díaz Ordaz abandoned the agricultural reform championed by López Mateos, the student movements he detested grew stronger and louder. Protests attended by as many as 500,000 people gathered to denounce Díaz Ordaz for his increasing willingness to incarcerate leftists. The most significant of them all was staged by just over 15,000 people ten days before the inauguration of the 1968 Olympic Games in Mexico City. Díaz Ordaz wanted the Olympics to display Mexico’s economic progress and social stability, but on October 2, protestors gathered at the Plaza de las Tres Culturas in Mexico City’s Tlatelolco section to chant “no queremos olimpiadas, queremos revolución”— we do not want the Olympics, we want revolution. Hoping to quietly end such protests, which he feared would hurt Mexico’s image internationally, Díaz Ordaz authorized the creation of a plainclothes police force, which infiltrated the crowd at Tlatelolco while government snipers occupied rooftops around the plaza. In the evening, the government forces opened fire, although it remains unclear exactly what caused them to do so. Over 1,300 protestors were arrested, and although official government records that were classified until 2001 claimed that only 38 people were killed in the Tlatelolco Massacre, tallies based on eyewitness accounts estimate the number to be closer to 400. This hurt Mexico’s image more than any previous student demonstration had, and tens of thousands of tourists canceled their reservations in the week before the Games. More significantly, this marked the beginning of Mexico’s Dirty War, as the government would, for the next decade or so, sponsor a militaristic counterinsurgency meant to silence leftist agitators once and for all. Both the media and the general population blamed Díaz Ordaz for the violence, and he defended himself by baselessly alleging that the police acted to defend themselves after foreign communists among the protestors shot first. Luis Echeverría, elected to succeed Díaz Ordaz in 1970, embodied Mexico’s contradictory Cold War policies. His foreign policy was designed to curry favor from Mexico’s generally liberal and anti-American population, as he “repeatedly called for Third World countries to maintain their economic independence from the United States.” Looking to emphasize Mexico’s neutrality in the Cold War, he became the first Mexican president to visit the Soviet Union and the People’s Republic of China. On the domestic front however, he embraced the use of violence of against Mexico’s radicals. During his presidency, right-wing paramilitary groups such as Los Halcones flourished and targeted leftists—on June 10, 1971, Los Halcones killed about 120 people in the Corpus Christi Massacre. At the same time, leftist groups themselves became increasingly violent, and guerrilla groups emerged. One group in particular, the Revolutionary Armed Movement (MAR), became particularly notorious after a series of bank robberies and kidnappings between 1971 and 1974. Most notably, the group kidnapped Terrence Leonhardy, the U.S. consul for Guadalajara, in May 1973. They held him hostage for four days before releasing him in exchange for the release of several prisoners. Mexico took its first step toward real democratization in 1977, when José López Portillo permitted the formation of new political parties and legalized Mexico’s Communist Party. However, this came as a bid to increase his legitimacy after winning the 1976 presidential election unopposed and not as a well-intentioned reform. Furthermore, the reform did nothing to reverse the Dirty War, as the government’s efforts had “wiped out the extreme left by the mid-1970s.” In the early 1980s, the last leftist guerrilla groups were defeated and disbanded. It took decades and further democratization for the Mexican government to support any real investigation of the Dirty War. Ernesto Zedillo, elected in 1994 and last in the PRI’s uninterrupted presidential line, implemented a series of reforms to free Mexico’s Federal Electoral Institute from government manipulation and revise campaign finance laws. These reforms successfully strengthened Mexico’s democracy, as the 1997 congressional elections were, at that point, “the most competitive ever held,” resulting in the PRI losing its congressional majorities. On October 2, 1998, Zedillo ordered an investigation into the Tlatelolco Massacre. Unfortunately, this yielded no real results as records remained secret. In 2000, Vicente Fox of the center-right National Action Party (PAN) was elected president of Mexico, putting an end to the PRI’s electoral dominance. In November 2001, he created the Special Prosecutor’s office and ordered it to investigate political violence during the Cold War; this move proved more fruitful and yielded thousands of declassified documents. A report released by the Fox administration documented the disappearance of 275 individuals and the torture of 523, and it was used to indict several former government officials, including Echeverría, on human rights abuse and genocide charges. Of course, these efforts did not expose each and every of the thousands of disappearances and killings of Mexico’s Dirty War, and many of those who carried out these despicable acts will have done so with impunity. But what role, if any, did the United States play in the political violence that occurred in Mexico during the Cold War? Immediately after World War II, cooperation between Mexico and the United States on security dramatically increased. The Federal Bureau of Investigation (FBI) helped organize Mexico’s Federal Security Directorate, while the CIA established contacts at every level of the Mexican government. Thus, the United States had considerable knowledge of Mexico’s security concerns during the Cold War, but refrained from intervening in any substantive way because “U.S. leaders knew that their Mexican counterparts shared their anti-communist orientation and trusted them to manage their own affairs.” There was an implicit agreement between the two countries, holding that Mexico would be allowed to pursue a foreign policy that presented a public challenge to the United States, but that on the domestic side, Mexico would align itself with the United States by fervently opposing homegrown communism. Beyond this, there is some concrete evidence of direct U.S. involvement in Mexico. For example, the paramilitary group Los Halcones was trained and obtained its weapons in the United States, which the Mexican government went to great lengths to conceal in the aftermath of the Corpus Christi Massacre. In 2003, the American government declassified documents pertaining to Mexico’s security preparations for the 1968 Olympic Games. Specifically, these documents revealed that the United States supplied the Mexican government with radios, weapons, and ammunition both before and after the Tlatelolco Massacre and that the CIA had been monitoring Mexico’s student protests movements for months before the Massacre but had been told by unnamed high-ranking Mexican officials that the situation was under control. Further declassifications in 2006 revealed the existence of LITEMPO, a secret network of high-level Mexican informants managed by the CIA’s Mexico Chief of Station, Winston Scott. Among these informants were Díaz Ordaz and Echeverría, both of whom were also personal friends of Scott’s. LITEMPO was in operation from 1960 to 1969, and was described in one internal document as “a productive and effective relationship between CIA and select top officials in Mexico.” In another memo, John Whitten, chief of the clandestine services Mexico desk, complained about the fees paid to the program’s informants, although it remains unclear how much the CIA paid Mexico’s former presidents. Their involvement clearly influenced the CIA’s response to the Tlatelolco Massacre, as the agency’s internal accounts of the incident regurgitate key aspects of the government’s account, including the presence of violent foreign communists. Clearly, Díaz Ordaz and Echeverría had a much closer relationship with the CIA than was previously known. The United States ensured its participation in the Dirty War was covert, and as such, its full extent remains unclear. It cannot be denied that the main driver behind Mexico’s Dirty War was the PRI’s desire to defend its power at any cost in the face of new leftist opposition, but it must also be acknowledged that the horrors that resulted were in line with America’s Cold War-era policy goals. Facing unprecedented opposition at home, the Mexico’s PRI government needed to prove its loyalty to the values of the Mexican Revolution if it hoped to preserve its legitimacy. Cooperating with the United States became a political liability for the Mexican government, and it faced no choice but to challenge American action abroad that the Mexican population generally perceived as imperialist. Early on in the Cold War, it did this by refusing to cut ties with Cuba, but by the late 1970s, the focus of Mexico’s foreign policy became Central America. Most significantly, Mexico opposed American policy relating to a leftist insurgency in Nicaragua and a civil war in El Salvador. In Nicaragua, the Sandinista National Liberation Front had begun its insurgency in July 1961 seeking to overthrow the right-wing government and pursue social and agricultural reforms. Under López Portillo, Mexico financially supported the Sandinistas mid-insurgency at the same time as the United States backed Nicaragua’s dictator, Anastasio Somoza, in an apparent suspension of mutual nonintervention. Mexico cut diplomatic ties with Somoza’s government on May 20, 1979. That July, he was deposed and the Sandinistas formed a Nicaraguan government of their own. Ronald Reagan’s victory in the American presidential election of 1980 stoked tensions with Mexico over Central America. Within the first few years of his presidency, the American government began to provide material support to the rightist Contra counterinsurgency in Nicaragua as well as to El Salvador’s conservative government. Mexico simultaneously aided leftist insurgents in El Salvador and called for peace negotiations at the United Nations in August of 1981. By February of 1982 it was clear that this strategy had failed to accomplish much, and López Portillo approached the Reagan administration with a plan to facilitate negotiations in El Salvador in exchange for an end to U.S. intervention in Nicaragua. Reagan stalled on a response, hoping that Salvadoran elections later that spring would help validate the ruling party. El Salvador’s far right emerged victorious, but this failed to stop the violence. Miguel de la Madrid succeeded López Portillo as Mexican president in 1982. Although he supported reforms that began to liberalize Mexico’s economy and believed that closer economic relations with the United States were needed to boost Mexico’s development, he refused to back down in Nicaragua and continued Mexico’s political and economic support of the Sandinista government. In 1983, Mexico formed the Contadora Group, along with Panama, Colombia, and Venezuela, as an alternative to the OAS in the search for a peaceful solution to the ongoing Nicaraguan crisis. Ultimately, the United States and Mexico did not have to find common ground in the cases of either Nicaragua or El Salvador. In Nicaragua, the Sandinistas allowed free elections for the first time in 1987, and lost power through this new medium in 1990. Meanwhile, U.N. arbitration of peace negotiations for the Salvadoran civil war began in late 1989, and resulted in a peace agreement in 1992. The Soviet Union officially dissolved on December 26, 1991, ending the Cold War and making Castro’s Cuba an international pariah. These changes “removed some obstacles to U.S.-Mexican collaboration, among others their differences over policies toward Central America and their assessments of the Soviet Union.” It was actually before the Cold War’s formal conclusion, in September of 1990, that Carlos Salinas, the Mexican president elected in 1988, declared that “trade integration with the United States had become a necessity,” foreshadowing the groundbreaking cooperation between the two countries that defined the turn of the century. The Cold War was an extremely uncomfortable period for U.S.-Mexico relations. The Cuban Revolution triggered an existential crisis in Mexican politics over the Mexican Revolution’s legacy, which in turn pushed the Mexican government to both oppose the United States on the international stage and use violence against its own citizens. For all intents and purposes, real collaboration between the two nations was a political impossibility during this period, and the Cold War’s conclusion brought with it a tremendous opportunity to change the bilateral relationship for the better. Jorge Familiar Avalos is a first-year student at Yale University, where he is studying economics. Born in Mexico City, he resides in Potomac, Maryland, on the outskirts of Washington, D.C. Because of his ties to both countries, the U.S.-Mexico relationship is one of his main academic interests. He is on staff with the Yale Review of International Studies, and he also writes an online column on Mexican politics for The Politic. “Cold War.” Gale Encyclopedia of U.S. Economic History, edited by Thomas Carson and Mary Bonk, Gale, 1999. U.S. History in Context. Pettinà, Vanni. “Mexican-Soviet Relations, 1958-1964: The Limits of Engagement.” Cold War International History Project. Wilson Center, 18 Nov. 2015. Web. n.p. Powelson, Michael. “Cuban Revolution.” Encyclopedia of Latin American History and Culture, edited by Jay Kinsbruner and Erick D. Langer, 2nd ed., vol. 2, Charles Scribner’s Sons, 2008, pp. 704-707. World History in Context. Teichert, Pedro C. M. “Latin America and the Socio-Economic Impact of the Cuban Revolution.” Journal of Inter-American Studies, vol. 4, no. 1, 1962, pp. 105–120. JSTOR, JSTOR. “Adolfo López Mateos.” Encyclopedia of World Biography, Gale, 1998. World History in Context. n.p. Covarrubias, Ana. “Cuba and Mexico: A Case for Mutual Nonintervention.” Cuban Studies, vol. 26, 1996, pp. 121–141. JSTOR, JSTOR. Fenn, Peggy. “México, La No Intervención y La Autodeterminación En El Caso De Cuba.” Foro Internacional, vol. 4, no. 1 (13), 1963, pp. 1–19. JSTOR, JSTOR. “The Cuban Missile Crisis: October 16–28, 1962.” Global Events: Milestone Events Throughout History, edited by Jennifer Stock, vol. 3: Central and South America, Gale, 2014. World History in Context. “Gustavo Díaz Ordaz.” Encyclopedia of World Biography, Gale, 1998. World History in Context. “The Tlatelolco Massacre: October 2, 1968.” Global Events: Milestone Events Throughout History, edited by Jennifer Stock, vol. 3: Central and South America, Gale, 2014. World History in Context. n.p. Latin American Newsletters. “Mexico: Conflict on the Campus.” Terrorism: Essential Primary Sources, edited by K. Lee Lerner and Brenda Wilmoth Lerner, Gale, 2006, pp. 41-43. World History in Context. “Luis Echeverría Alvarez.” Encyclopedia of World Biography, Gale, 1998. World History in Context. “The Tlatelolco Massacre: October 2, 1968.” Global Events: Milestone Events Throughout History, edited by Jennifer Stock, vol. 3: Central and South America, Gale, 2014. World History in Context. Pansters, Wil G. “Spies, Assassins, and Statesmen in Mexico’s Cold War.” ERLACS. European Review of Latin American and Caribbean Studies, 27 June 2017. Web. n.p. Doyle, Kate and Jefferson Morley. “LITEMPO: The CIA’s Eyes on Tlatelolco.” National Security Archive. George Washington University, Oct. 18, 2006. Web. n.p. Everingham, Mark. “Nicaragua, Sandinista National Liberation Front (FSLN).” Encyclopedia of Latin American History and Culture, edited by Jay Kinsbruner and Erick D. Langer, 2nd ed., vol. 4, Charles Scribner’s Sons, 2008, pp. 835-836. World History in Context. Herrera, René, and Mario Ojeda. “La Política De México En La Región De Centroamérica.” Foro Internacional, vol. 23, no. 4 (92), 1983, pp. 423–440. JSTOR, JSTOR. Arnson, Cynthia J. “El Salvador.” Encyclopedia of Genocide and Crimes Against Humanity, edited by Dinah L. Shelton, vol. 1, Macmillan Reference USA, 2005, pp. 282-286. World History in Context. “Adolfo López Mateos.” Encyclopedia of World Biography, Gale, 1998. World History in Context. 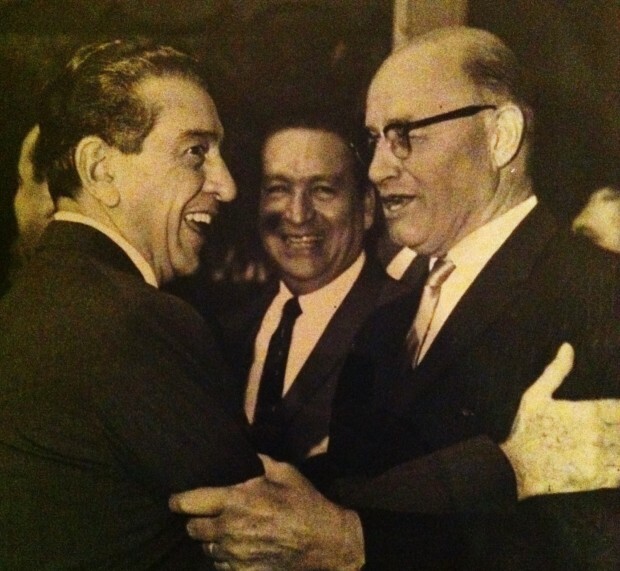 Domínguez, Jorge I., and Rafael Fernández de Castro. United States and Mexico: Between Partnership and Conflict. 2d ed. New York: Routledge, 2009. Doyle, Kate. “‘Forgetting Is Not Justice’: Mexico Bares Its Secret Past.” World Policy Journal, vol. 20, no. 2, 2003, pp. 61–72. JSTOR, JSTOR. Doyle, Kate and Jefferson Morley. “LITEMPO: The CIA’s Eyes on Tlatelolco.” National Security Archive. George Washington University, Oct. 18, 2006. Web. Keller, Renata. Mexico’s Cold War: Cuba, the United States, and the Legacy of the Mexican Revolution. Cambridge: Cambridge UP, 2015. Keller, Renata. “U.S.-Mexican Relations from Independence to the Present.” Oxford Research Encyclopedia of American History. Oxford Research Encyclopedia of American History, Mar. 2016. Web. Pansters, Wil G. “Spies, Assassins, and Statesmen in Mexico’s Cold War.” ERLACS. European Review of Latin American and Caribbean Studies, 27 June 2017. Web. Pettinà, Vanni. “Mexican-Soviet Relations, 1958-1964: The Limits of Engagement.” Cold War International History Project. Wilson Center, 18 Nov. 2015. Web. Sloan, Julia. “Carnivalizing the Cold War: Mexico, the Mexican Revolution, and the Events of 1968” European Journal of American Studies, European Association for American Studies, 18 Mar. 2009. Web.